While Douglas Bostock and ClassicO gave the Second Symphony an outing in 1997 the present disc is bound to be preferred. Its coupling is more substantial; indeed completely compelling. We do not think of Jacob as anything other than a writer of didactic music. That's our loss. His production was much more varied as we are slowly discovering. These two symphonies can loosely be said to be the products of two world wars; one a decade after the Great War; the other in the last year of WWII. The First Symphony is dedicated to the memory of Jacob’s brother Anstey, killed on the Somme in 1916 at age 22. Jacob himself was made a POW in 1917. It is in five movements. The splendid allegro e molto risoluto is full of stomping energy and with much work allocated to the brass benches. It's radiant stuff ablaze with echoes of Vaughan Williams, and Sibelius. The second movement lento e mesto has a sombre Holstian mien recalling the Dirge for Two Veterans and RVW's Dona Nobis Pacem. Cares are cast aside for a brief and flighty scherzo. The larghetto with its skirling bird chirrups briefly recalls Nielsen and at other times RVW and is warmed by a Delian ambience. Once again the brass section is given plenty to do and are recorded with satisfying eminence. This is a brilliant work with echoes and rivulets from the continent: de Falla, Ravel and Stravinsky. While quite different I have already mentally bracketed this with Bliss's Colour Symphony premiered at the Three Choirs in 1922 and with Rootham's bellicosely athletic First Symphony a recording of which is soon to be reissued by Lyrita. 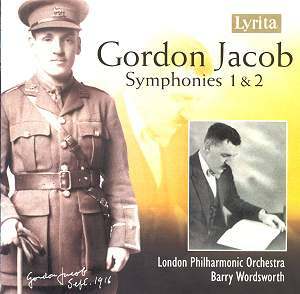 Jacob described his Second Symphony as a meditation on war, suffering and victory. At least it was premiered - unlike its predecessor. The second symphony was given its first performance on 1 May 1946 conducted by Boult. Rudolph Schwarz gave it its first public outing in Bournemouth on 30 June 1948. It opens ominously but soon finds brightness and an optimistic élan. The brass writing is as thunderous as that found in Alwyn's Fourth Symphony and in the tricky surging rhythmic waves that open Tippett's Second Symphony. The second movement is surprising for its Warlock-Van Dieren expressionist string writing and for the tragic dissonance of the brass which later clarifies for a long episode of Elgar-Finzi-style meditation. The scherzo flies away and is dusted with the humour of brass, bassoon and woodblock. As in the First Symphony there are moments where the string writing sounds influenced by 1930s Tippett and even the Gloriana years Britten. The finale is touching and Finzian redolent of those Bachian skirls in the Grand Fantasia and Toccata. The notes are by Eric Wetherell. All credit to the LPO and Barry Wordsworth who make of these two very unfamiliar or completely unfamiliar works something confident and not at all tentative. If you have even a passing interest in the British symphony you must have this disc. While it may take you a while to read your way into Jacob's style you will find plenty of familiar way-markers and the rewards keep coming with every audition.